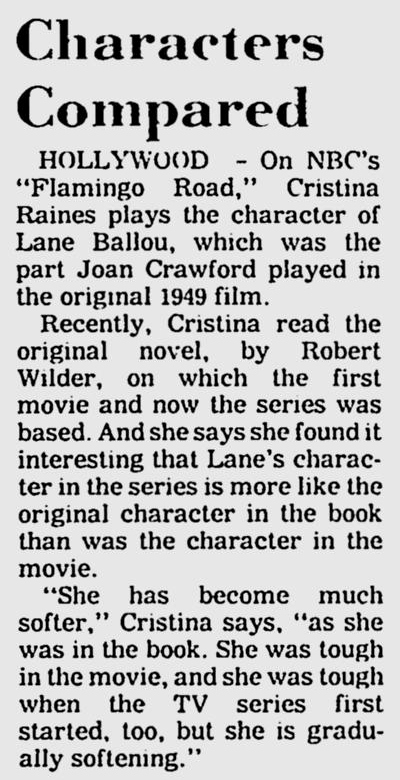 Here's a quick news item from early 1982 in which Cristina Raines discusses Lane Ballou, her character from the TV series Flamingo Road. Flamingo Road began life as a 1942 novel written by Robert Wilder and was made into a film in 1949. The article indicates that the Lane Ballou of the television show is more similar to how the character was portrayed in the book, rather than Joan Crawford's cinematic interpretation.